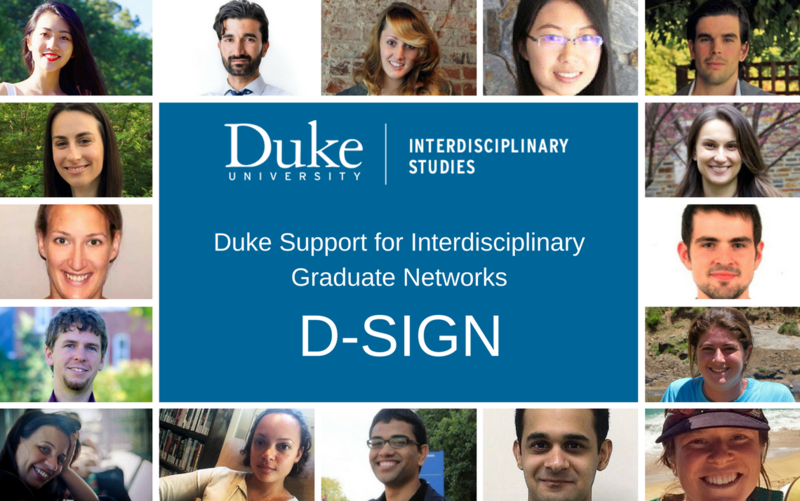 The Office of the Vice Provost for Interdisciplinary Studies has awarded Duke Support for Interdisciplinary Graduate Networks (D-SIGN) grants to six graduate student groups for the 2017-2018 academic year. This internal funding mechanism encourages graduate students to explore beyond disciplinary lines, both in research and coursework. The goal is to enable graduate students to build or extend their networks and to integrate collaborative, cross-school experiences into their programs, thereby increasing the number of individuals whose graduate training reflects Duke’s commitment to interdisciplinarity and knowledge in the service of society. A January 2017 RFP invited all current Duke graduate students (including master’s, professional and Ph.D. students) to propose an interdisciplinary project, training or experience lasting up to a year. Proposals were reviewed by an ad hoc committee convened by the Vice Provost for Interdisciplinary Studies with representation from faculty, institute directors and graduate students. The first cohort of D-SIGN grantees (2016-2017) included Duke Conservation Society; Global Alliance on Disability and Health Innovation – Children and Adolescents Project; Global Energy Access Network (GLEAN); Rethinking Regulation – Graduate Student Working Group; and A STEM Researcher-Educator Network to Improve K-12 Science Literacy.